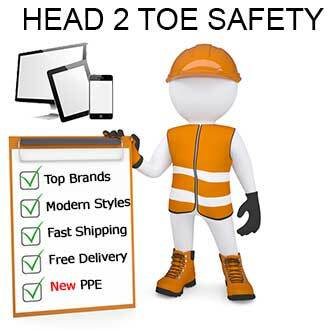 Our collection of safety footwear is one of the most comprehensive collection available, we have created a collection of boots and shoes, which are stylish and comfortable and deliver the everyday practical safety protection your occupation requires. We have developed a reputation of giving customers a great choice of styles and designs from a wide variety of market leading brands, whilst also delivering a customer service package that gives confidence to customers. Unlike many companies we believe that customer service is not just about taking an order and delivering it on time it is about the other things that not everyone uses but you can be assured we are there when you need us. Our approach is an old fashioned simple one we talk to our customers and that does not mean only by text or email. We have people in our customer services department who are trained in the products we offer and can help you with your questions or queries, we do not just take orders, we offer a friendly and helpful service that feels familiar to the kind you used to experience at your local clothing and footwear shop. 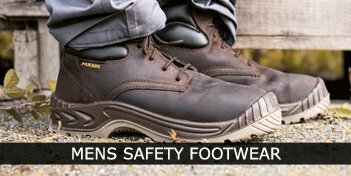 Our collection of safety boots and shoes is ideal for both Men and Women in the workplace and has been compiled to offer you a great selection of styles and designs so you can select the right footwear that is suitable for your occupation. We continually update and add to our ranges and have a number of exclusive styles and brands that you will not find anywhere else in the UK. This approach of seeking out innovative new designs clearly confirms us as the market innovators and we can continue to boast a number of firsts. Charnwood was the first company in the UK to introduce safety sneakers to the market and we constantly strive to work with European based manufacturers and thus have one of the finest collections of Ladies Safety Boots and Safety Shoes available in the UK today. Our drive to deliver to our customers new and innovative styles means that sole traders and companies are able to express their unique individuality which enables you to safely stand out from the crowd. 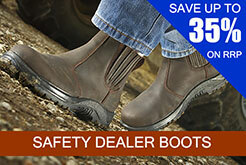 Our selection of Ladies safety boots and safety shoes is quite simply stunning. Our staff works tirelessly to develop this area of our business and in recent months have introduced some absolutely fantastic styles. This year we have been working with a number of European manufacturers and the results are clear to see the Delia High Leg Boots are a UK first. 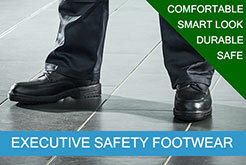 These extremely stylish and desirable boots with a high quality black leather upper have embraced the high street designs which are desired by women on the high street and the end result is a model that looks and feels like a fashion boot should yet delivers superb safety protection for use in and around the workplace. The Delia is a great example of our drive and determination to bring you styles that you want. So it is worth keeping an eye on our Ladies Safety Footwear collection as we are constantly introducing a vast amount of styles that you will not find anywhere else, as our safety footwear for Ladies in the work place has been selected by women for women. Some companies claim to know their products, but do they know them as well as us? Well we do not think they do and the reason for this is that we literally test and try every style we sell. Our customer services team and sourcing team do not just introduce into the range a style or brand just because it looks great or it may be in a particular price bracket. We try them on test them and depending upon the conclusions of these tests and trails determines if they are suitable to be added to our collections. This rigorous attention to detail is very time consuming but has been extremely successful and helped us grow our range to what it is today. This philosophy puts us in a unique position that we really do know our footwear inside out and this ultimately results in our team of customer service staff can competently answer your queries and questions on the styles and fitting which helps select the right footwear for you. 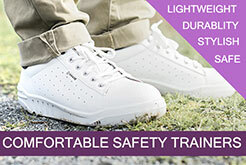 Having comfortable and stylish safety footwear is as important as the protection they provide, we have a wide number of exclusive styles from innovative market leading brands like Parade that deliver you the functional safety features that you require to work safely, but are so comfortable you will may forget you are wearing safety boots at all. Make sure you get the right fit, obvious you may say, but there are a vast number of people that just accept what they get given or what they can find quickly. The fit is an extremely important factor when it comes to delivering comfort and the vast majority of the Safety styles that are available for women have not been designed and manufactured on the correct width for a Woman's foot. The Ladies styles that we have to offer have been designed for a Ladies foot, which in the majority of cases, is narrower than a Man's. So, if you have struggled with the correct fitting footwear try brands such as Parade or Lavoro who design and make shoes and boots in a Ladies fitting. If you are looking for pair of footwear in a Man's fitting, we have several styles and brands that have some great features that can enhance your comfort and help you have better overall foot health. Here are some great features you may want to consider from our most popular brands. Parade have several exclusive features which have been developed to enhance your comfort whist giving you the optimum safety protection and durability. These features include the very popular VPS system and DRS system which helps support the foot and reduce the impact shock you get from walking on hard floors and surfaces. In addition to these two great features Parade have developed a Parade Air comfort bubble, this feature which is available on several styles is in the heel area and gives you great cushioning and comfort. The No Risk collection of footwear has a great exclusive feature that not only enhances wearer comfort but is also environmentally friendly. The Clima Cork system is a natural Cork foot bed which wicks moisture away from the foot and helps prevent the build-up of excess sweat and moisture. This moisture wick properties help promote better foot health and enhance the overall comfort experience for the wearer. Another collection to seriously consider is the Giasco collection from Italy. This range of footwear has a number of features to enhance wearer comfort but the exclusive Ergo outsole is a popular choice as this technological breakthrough not only delivers good levels of grip, but also helps reduce the fatigue and can in some cases improve the wearers posture. 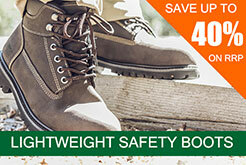 Giasco have a reputation for producing attractive and lightweight styles of safety footwear for Men and Women.